When Lucy Ricardo got in trouble in the I Love Lucy TV show, she might have less “splainin’ to do” if she’d softened up Ricky’s heart with this Cuban black beans and rice recipe. Sauteed vegetables, bacon, cumin, and chorizo, give these beans an authentic Cuban flavor. Serve them with plain white rice and lime wedges. You can add sour cream or hot sauce, if you want, but I don’t think they need much dressing up. You’ll want to use dried, Spanish style chorizo in this dish, not the fresh Mexican kind. My local supermarket doesn’t carry it, but they do carry a chorizo sausage made by Colosimos, an excellent local sausage company. I cook it that up to use in place of the Spanish chorizo. The original recipe calls for 1/4 cup minced cilantro. I like cilantro, but not enough to buy it. It has a kind of “soapy” aftertaste to me, so I’ve substituted dried parsley. Dutch oven or large pot. Heat 1 teaspoon oil in a large Dutch oven over medium heat. Add the bacon and cook until crisp, about 6-8 minutes. Stir in the onions, bell pepper, cumin, and salt. Continue cooking until the vegetables are softened, about 8 minutes. Stir in the garlic, red pepper, and oregano. Cook until fragrant, about 15 seconds. Add the broth, bay leaves, beans, parsley, and sausage. Simmer, stirring occasionally, until the broth reduces and thickens, about 10 minutes. Remove the bay leaves. Season with salt and black pepper, to taste. Spoon the beans over rice and squeeze a bit of lime juice over them. My good friend and cookbook author, Mark Hansen , issued a challenge from his Dutch oven cooking blog some time ago to deconstruct/reconstruct a peanut butter sandwich. He made a killer desert in the Dutch oven, of course. Not being a Dutch oven guy, I took a little different route. My version takes it’s inspiration from the Italians: peanut butter ravioli with a raspberry jelly sauce. For those who don’t know, deconstructing a dish is a way of learning more about how the ingredients work by tearing a dish down into its component parts. In this case: bread, peanuts, fruit and sugar. Bread can be further subdivided into wheat flour, eggs, water or milk, and oil. Reconstruction is taking those components and putting them back together in new ways to create a new and original dish. When I do deconstruction/reconstruction, my goals are to create a magic experience as people enjoy familiar flavors in new ways. Not all of my experiments work out. This one is a keeper. I’m not going to kid you. This dish takes a bit of work, mostly because I make my own pasta dough. You could use commercially prepared pasta doughs such as fresh lasagna noodles, egg roll wrappers, or wonton wrappers. If you use my pasta dough recipe, you won’t need the whole thing. 1/4 to 1/2 will make plenty of raviolis. Special thanks to my “sous chefs,” a.k.a. my children: Art Girl and the Boy. Working with about 1/4 of the dough at a time, roll it out into long rectangular strips using a pasta roller. Work your way down to the next to the last setting. You want these to be thin and flexible, but not too thin. Lay the dough out onto slightly damp towels to keep them moist until you need them. This post about rolling and cutting pasta dough will help you. In a medium mixing bowl, mix together the peanut butter and confectioners sugar to create a kind of soft dough. It’s okay if it’s a little sticky, but not too much. You may need to adjust the amount of sugar to compensate for the varying oil content in different peanut butters. Refrigerate for 5 minutes. 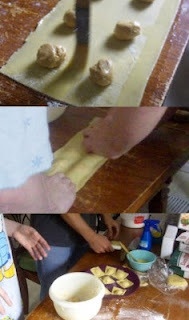 To assemble the raviolis, roll the peanut butter mixture into small balls, about 1-inch in diameter. If the peanut butter mixture becomes too soft to work with, put it back in the refrigerator for a few minutes to firm up. Lightly flour your work surface and lay out one sheet of pasta. Position the peanut butter balls on the pasta sheet in two rows, about 1 1/2-inch apart. Using a pastry brush, moisten the spaces between the peanut butter with a bit of water. Drape another pasta sheet over the top and gently press down between the peanut butter to seal. If the dough is too dry and starts to crack as you lay it out, or doesn’t stretch well over the filling, spritz it with a bit of water from the spray bottle to loosen it. Using a sharp knife or pastry cutter, cut the raviolis apart and trim the ends. Knead the trimmed dough back into the rest so you don’t waste it. Using a pastry knife or thin spatula, transfer the raviolis to plates and refrigerate about 5 minutes, or until ready to cook. Now it’s time to make the jam sauce. In a small saucepan over medium heat, mix the jam and water. Remove from heat and allow to cool while you cook the raviolis. You may need to adjust the mount of water to create the desired consistency. You want to be able to pour it well, but not be too thin. Bring 4 quarts of water to boil in a large pot. Reduce to a simmer. Remove the raviolis from the refrigerator and gently add them to the water. Simmer for about 3 minutes, until the ravioli is all floating on top and the pasta is cooked. Remove from the pot and drain on clean kitchen towels. (Don’t use paper towels. The pasta will stick to them and them you’ll have bits of paper on your pasta.) Work in batches so you don’t crowd the pot. Let them cool to room temperature. Now it’s time to assemble the plates. Place 5 or 6 raviolis on each plate. Using a small strainer or sifter, dust the top of the raviolis and the plate with confectioners sugar. Drizzle the jam sauce over the raviolis and serve. Stand back and watch the magic as your family and friends devour them. You can drizzle honey over the ravioli if you’d like, but it isn’t nearly as good. The acidity of the raspberry jam provides a balance for the sweetness of the rest of the dish. In fact, I’ve been thinking that adding a teaspoon of lemon juice to the jam sauce might be even better. Other fruit jams would be tasty as well.